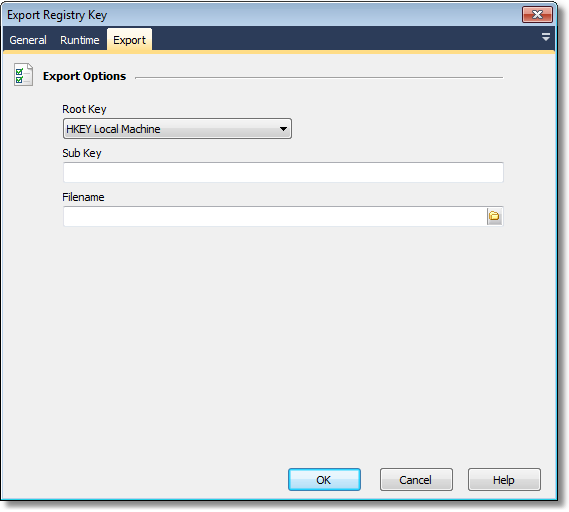 The Export Registry Key action enables you to export a registry key as registration (.reg) file. The root key of path that is to be exported. Possible keys are 'HKEY Local Machine', 'HKEY Current User', 'HKEY Classes Root', 'HKEY Users' and 'HKEY Current Config'. The remaining path to the key that is to be exported. For example 'Software\Microsoft\Windows'. The registration file that the key will be exported to.